The ALF is a brand of the Kurdish People’s Protection Units (YPG), which has been created in an attempt to distance the group from constant attacks on Turkey-led forces in the region of Afrin. The YPG is a core of the US-backed Syrian Democratic Forces (SDF) and official YPG statements providing details into attacks on the Turkish Army and its proxies, which were observed in 2018, were fueling tensions between Ankara and Washington. Now, when the YPG rebranded its units attacking Turkish targets, the US has an opportunity to claim that its ‘local ally’ is not involved in these developments. On April 3, Russian warplanes conducted a new series of raids against terrorist targets in the Idlib de-escalation zone. This time airstrikes hit Hay’at Tahrir al-Sham positions at the hill of Nabi Ayoub, which is located in the area of Jabal Zawiya. The April 3 strike was the first aerial attack on Idlib terrorists since March 22. 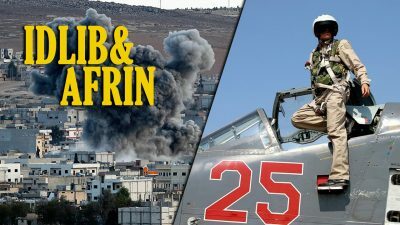 Back then, warplanes of the Russian Aerospace Forces conducted a series of airstrikes near the towns of al-Fu’ah and Kafriya in eastern Idlib. A low intensity of this Russian activity demonstrates that the widely-speculated Syrian Army operation in the Idlib demilitarized zone is not expected anytime soon. On April 4, Israeli Prime Minister Benjamin Netanyahu visited Moscow for negotiations on the situation in Syria with Russian President Vladimir Putin. Following the US recognition of the occupied Golan Heights as a part of Israel, Tel Aviv is aiming to consolidate its gains on the diplomatic front. Another goal of the Israeli leadership to undermine the Russian-Iranian cooperation in the region. However, so far, these efforts have been unsuccessful. Israel’s ImageSat International released satellite images showing two buildings, which were hit in the March 27 Israeli airstrikes on the Shaykh Najjar Industrial Zone, northeast of the city of Aleppo. Both buildings are located in the northwestern part of the industrial zone, according to ImageSat’ photos. One of them appears to be a storage hangar. Israeli media claimed that Iranian forces were using both buildings for military purposes. However, there has been no evidence to support this claim so far. Videos released from the ground shows that the targeted buildings were a kind of industrial facilities.